EMERALD'S own Addison Spelta has joined the tournament water-skiing circuit at only eight years old, competing recently for the first time in round five of the 2018-19 Central Region Tournament Waterski series. Held at the Mount Morgan Dam, skiers travelled from as far as Mackay, Rockhampton, Moura and Emerald to compete. The youngest competitor at the event, Addison skiied the entire mini course and completed her two gates, finishing an impressive fourth in division six for the weekend. "It was the best feeling, your heart pumps really hard when you're getting out around the buoys,” Addison said. 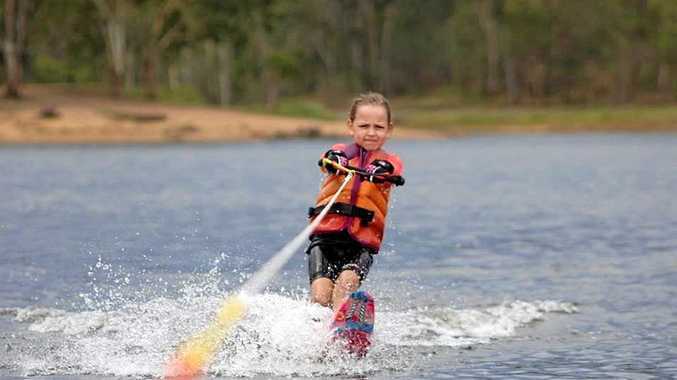 Addison may only be new to the sport, but slalom water-skiing runs in her blood. Her father Anthony Spelta currently skis at an impressive 55km/h, competing at a national level, and her mother Lois Spelta took home the third place medal at last week's competition. Mrs Spelta said she and her husband were really proud of their daughter. "Addison has a really good spirit. She's really enthusiastic about it,” she said. A competitive skier herself, Mrs Spelta said Addison would soon be beating her at competitions. "She's going to go around me soon. She's taken to it so well,” she said.